£416 milion for 1 years sponsorship? This seems excessive. Has anybody seen this before? Is it potentially a bug? Have you had some sort of tycoon takeover? This is one of the ways I believe they get around FFP regulations. hmmmm... could it be FMs way of showing a company that one of your directors owns pumping in cash? Although even for that it does seem excessive, as you say. 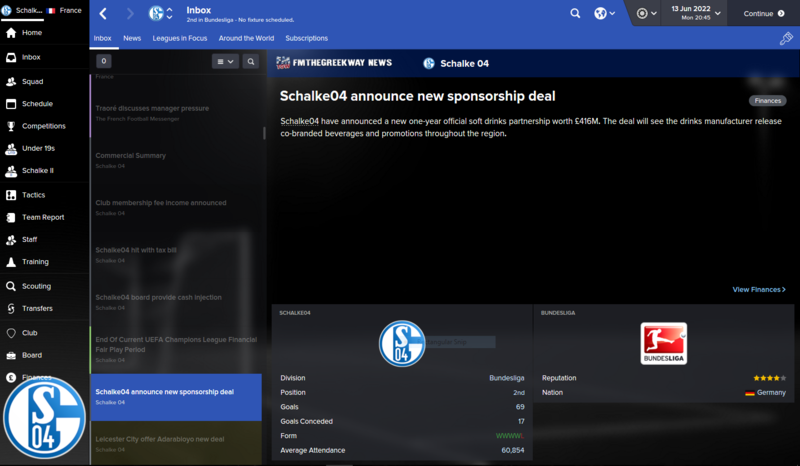 Maybe Red Bull have sold Leipzig and bought Schalke in your game? Can't be a tycoon takeover in Germany - no one person can own more than something like 49% of a club. Could be the user has added a 'sugar daddy' via the editor - basically this will occur (ie the huge sponsorship) when a sugar daddy owned club is in danger of failing FFP. It's their way of injecting funds to get around the FFP regulations. They could have easily added tycoons to Germany via takeover edt. Not sure what good can come from speculating on a screenshot from an unknown person. Neil has give the most likely reason & as it requires changes to the default data to get a tycoon in Getmany there could be all manner of edits in whatever game that screenshot came form. Short version: Time to close this one.